Freekeh is high in both protein and fiber, making it a great rice alternative when you're trying to reduce your body fat. Halibut a very lean protein that pairs well with the strong flavors of chopped mint and the metabolism-boosting spices in the garam masala. For a low-carb option, simply omit the freekeh and pair the seared halibut with a bed of fresh greens. In a saucepan on low heat, sweat the shallot with the garam masala. Add the freekeh and water and cook until the liquid is absorbed, about 15 minutes. Cover, remove from heat, and let sit for 5-10 minutes. While freekeh is cooking, season the halibut with salt as you heat an oven-proof pan on high heat. Gently place the halibut in preheated pan with a little bit of oil. Let the fish sear on high for 3-4 minutes, then move the pan to the oven. Finish halibut in oven for another 4-5 minutes. In a shallow pan of water, add the peas and cook 2-3 minutes. Finish with chopped mint and salt to taste. 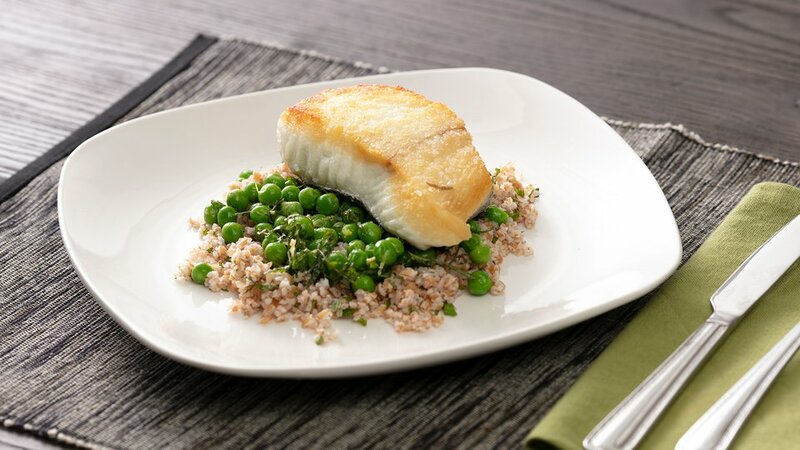 Serve the peas over the freekeh, and top with seared halibut.